Forget worrying about this being sold out again and buy your fire trucks now. 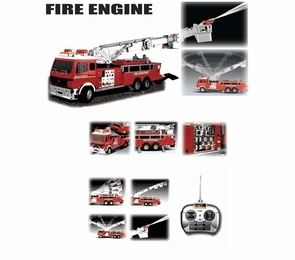 Best and biggest remote control fire truck that shoots water and measures 2'3" long. Plus, the ladder goes up and down, inclines, and extends about 12 inches. This is one amazing hook and ladder fire truck. Then you can rotate the ladder 340 degrees and fire the water too. This is a really cool fire truck that offers amazing detail and quality. Want more? This truck has a working rear winch, flashing siren lights, head lights, brake lights too. Great for the fire house to. Drive forwards, backwards, left, and right plus control the ladder and water shooting function all from the included wireless remote control. Check out the videos below. Dimensions: Length 2'3" Width 6.4" Height 2'2"
Emergency lights and realistic siren sounds. Thank you guys. Great job. Great truck! Ordered the Big Truck for a 6 year olds surprise Bday tour of the fire station. The guys at the station had a blast &quot;testing it&quot;. The kid is going to freak out when he see's it! Worth it!